May 15 Why are there no good films about Football? It's generally safe to say that Football is the most popular sport on the planet. We know hundreds of millions watch cricket, that the Superbowl draws huge audiences, as does the Olympics every four years, but Football is king. There have been films made about nearly every sport you can imagine, and some are particularly good. American sports in general translate well to the big screen, especially from a romantic point of view. From classics such as Bull Durham and Rocky, to the timeless Tin Cup, the Americans just do these films well. Why then, does worlds most popular game not manage to get it right on the silver screen? 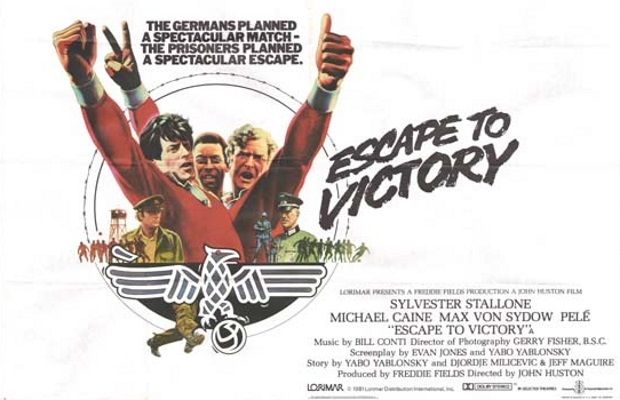 "What about Escape to Victory?!" you may cry. Well to be honest it was gimmicky and watchable but doesn't really capture the sport itself. Perhaps the tribal element of supporting a football team is too strong to make your average fan interested in stories about other teams or countries? Or is it simply that the game itself needs no further glamourising? Certainly the worlds best players don't need the added recognition of being immortalised by an actor, they are already more well known. And who could possibly play Zlatan? When Saturday comes was a valiant effort at catching something of the essence of football, but it was also a personal showcase of Sean Bean, and his beloved Sheffield United. The Damned United is the best one we've seen, and that was character driven, the sport itself was somehow secondary to the larger than life figure of Brian Clough, brilliantly played by Michael Sheen. Can we suppose that the subject matter is emotive enough? There are countless stories from the sport that deserve telling and would translate so well to the big screen. The Busby Babes, The Lisbon Lions, Greece's 2004 Euro Winners, let alone the potential stories about fabled teams such as Puskas Real Madrid and more recently the unbelievable achievement of Leicester City winning the 2016 Premiership title. Instead, 'Shaolin Soccer' and 'Goal' (1,2 & 3) are what we have to work with. Surely there must be an opportunity to do better than that with the one sport that is truly global?